It is well past midnight on a rain- and sauce-sodden Mary Street and a gaggle of weary and bleary-eyed Paddies are having difficulty launching a desperate assault on a McDonalds. We are unsure as to why; either they cannot navigate the complicated entrance - to push or pull? - or are being spurned by bouncers who appear as if they are paid in half-pounders rather than pound notes. Suddenly, they break into the day's belated first rendition of 'Fields of Athenry', a forlorn effort to rally the troops. It has minimal effect, as if to sum up the day for their team, when even the simplest of tasks seemed beyond their lavish gifts. Earlier, in the 44th minute of a game that Ireland had already long ceded, a retreating scrum amply illustrated their day-long toil. With Tadhg Furlong, again, unable to pose as the fulcrum we know he can be, Ireland's pre-planned play was never going to be possible but, stubbornly, they persisted with it anyway. 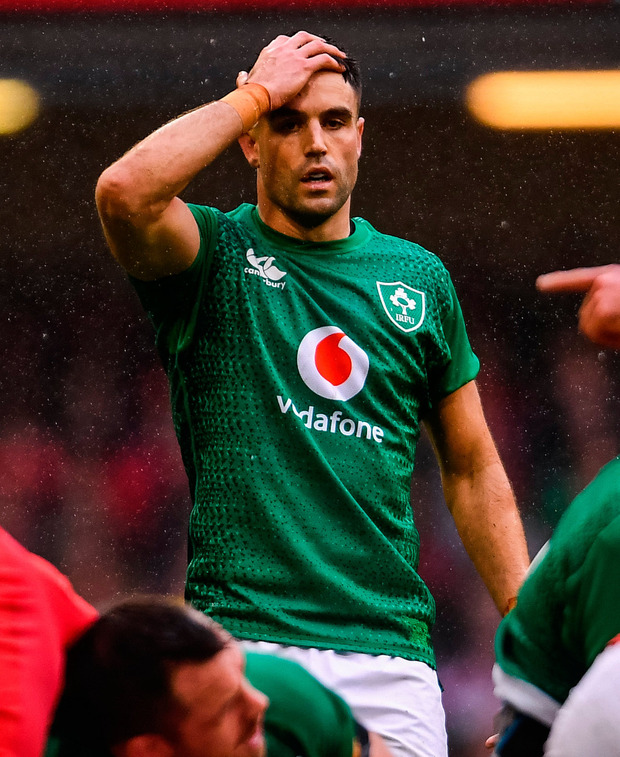 Conor Murray scrambled to switch the play inside to Bundee Aki, vaguely reminiscent of a move we had seen against New Zealand just months before, when it seemed the team were atop a summit of lofty status. Yet this time the advancing red wall, led by the irrepressible Alun Wyn Jones, had read the move like a children's story book and, when Aki received the ball, he was buried in a hole. A painfully slow recycle resulted in Jonathan Sexton booming a kick to touch on the full, widening the chasm. Devoid of the early control they need to maximise their expected dominance of set-piece and possession, Joe Schmidt's team are unable to creatively adapt. The certainty that has defined this side for so many years under Schmidt, the rigid application to detail, hot-housed in the most stringent of environments, has, yet again, been marked absent. In a week when the defeat of France and the strident words of Sexton and Murray seemed to becalm the worries of their supporters, this most calamitous catastrophe has shook the very foundations of the misplaced restoration of belief. Even the coach seems taken aback, his inability to now confidently assess the future instead supplanted by a comforting reflection that what Ireland have done before will somehow return to save them. "I'm not sure," he replies unconvincingly when asked whether teams have worked them out. On the basis of a game where they carried the ball over two-and-a-half times more than the opposition (for some 257 metres more too), as well as making twice as many passes and creating twice as many rucks, it can be safely said that Wales, like England, worked them out alright. Wales didn't need to come up with any answers because Ireland didn't ask them any questions. Clinging desperately to a style of play imposed by the coach, and a cohort of key players instructed to deliver it, all of which had formed the bedrock of their previous dominance, Schmidt's Ireland are now imprisoned in a straitjacket. The unswerving loyalty to the method is matched by an illogical fidelity to under-performing world-class players whose form has fallen off a cliff. Sexton and Murray are not alone in being fortunate to survive for so long; the out-half, Schmidt's on-field general, is unable to assert his usual dominance and is seemingly incapable - or is not allowed - to demand a tactical shift. All the while, Kieran Marmion, required - but truly trusted? - when Ireland defeated the All Blacks, wallows on the bench alongside Jack Carty, not to mention Jordan Larmour too. Schmidt's insistence on deploying the squad's depth is ridiculed by this intransigence; it is no coincidence that Irish shirts numbered 21, 22 and 23 combined for Ireland's consolation. Schmidt speaks of delivering players into a pressure cooker situation; when he did so on Saturday, the dinner had already been burnt to a crisp. There was a high-profile casualty; Sean O'Brien hooked with the indecent haste that should have been applied to similarly drowning colleagues. But where do they go from here? Dave Kilcoyne suggests they need to go backwards to go forwards but this is precisely why Ireland are in this position. Their incessant desire to physically bully teams has failed them in the only two pivotal tests of this window. Termed a quasi-World Cup dry run, the Six Nations was instead a complete washout. The one note of positivity comes eventually from Schmidt who admits his side need "to change it up" when their game-plan goes awry. That is now his responsibility, presuming he allows himself to escape from the habits that formed his greatness in the past. Because now is only about the future, not the past. And the only certainty is that he must change, and allow his players to do so, too.